I recently had an opportunity to chat with Mr. Brant Bjork for Heavy Planet. The multi-talented musician discussed everything from his myriad solo projects and the Palm Desert scene to African jams and Thelonious Monk. And oh yeah…he also had a lot to say about a little project called Kyuss Lives! On the eve of the triumphant homecoming for the godfathers of desert rock…you do not want to miss this one of a kind interview. Toby from Heavy Planet: I just wanted to start off by congratulating you guys on the tour so far and the sold out shows out in Europe and Australia. I realize that you just got back from there…what a month ago…a couple of weeks ago…from doing the festival circuit over in Europe? 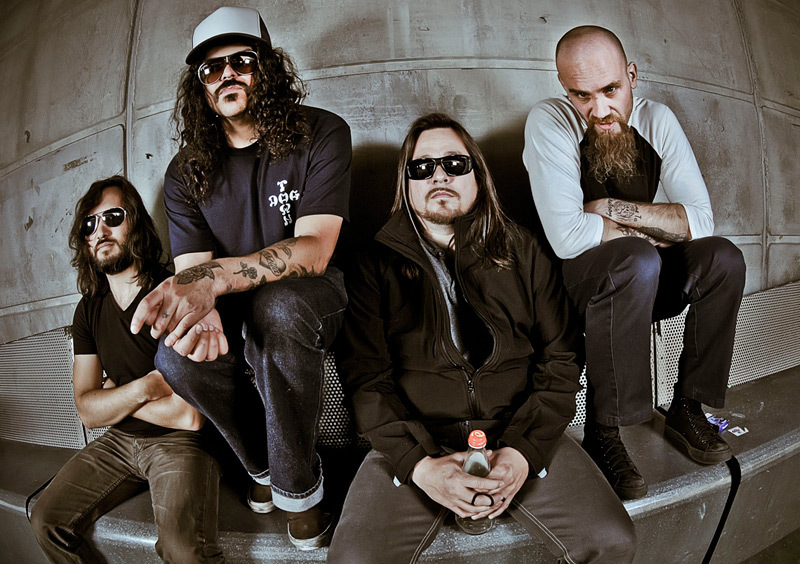 Brant Bjork: Yeah…we've been going back and forth to Europe for about the last six months, so we just finished our European dates…like you said about two weeks ago. It was awesome we had a great time in Europe this year. HP: That's great. So are you guys excited to be back Stateside getting ready to play some shows over here? BB: Oh absolutely…I mean, we just couldn't even be more excited. It's been so many years since we've all obviously, collectively played the United States and I'm gonna be honest, we really want to...you know…rock the States man. As a lot of people know, the States can be a difficult area for rock music and it's a little bit more of a challenge than Europe, but we're really eager and excited to confront that challenge and to have a good time as well. HP: I know I'm excited to see you guys. I've already gotten my tickets for DC so I'm really excited for it. HP: Well in terms of coming over to the States, are you guys planning on doing anything differently? Any kind of surprises or changes to the setlist? Anything like that? BB: Well, we have what we call our standard set, which is about 90 minutes and it just flows really nice and we celebrate and touch upon all of the records. Even some nights we'll pull out a song from Wretch. But really I'd say maybe each night we might swap a couple songs out. Some nights we'll open up with something different…every night or every other night we'll switch things up. HP: Yeah I was gonna ask you regarding the setlist, since John was really the only constant on the three albums…aside from Wretch obviously…and since you and Nick didn't play on the …And the Circus Leaves Town album…what's the dynamic there? Do you guys take ownership of those songs as well…or is it sort of weird playing the music off of that album…how does that go? BB: No…I mean, I feel very comfortable…speaking for myself…I feel very comfortable playing the Circus songs. I mean obviously I've always been fond of the records that I actually participated with, but I think Circus is a great record, the songs are fantastic and I was really excited to play those songs on the drums and I've been having a blast doing so and I really enjoy it. I think I can speak for Nick and say he really enjoys playing those songs as well. And you know, Kyuss really…there are different lineups and different records of course…but Kyuss really was a very specific band doing a very specific thing and even though I wasn't there at the end, I still feel a connection with the band and the music as a whole. So I think it's natural that we gravitate with confidence towards the music that we all created together just as basic chemistry would, but from the get go, we had quickly agreed that we wanted to celebrate all the Kyuss music really. HP: Going back to when the ball started rolling with Kyuss Lives…I know that John was playing under the moniker “Garcia Plays Kyuss” at…what was it…the Roadburn Festival when you and Nick joined him onstage back in 2010? BB: Actually that was the Hellfest in France. HP: So was that something you guys planned or was it kind of a spontaneous thing? BB: Actually, that was spontaneous. I had gotten wind that John was gonna go out and do Kyuss songs with three other European musicians under the name "Garcia Plays Kyuss" and not long after I had been told that, he got in contact with me and asked me if my solo band would do a couple weeks of dates with them in Europe. I said sure…you know…I was excited that John was going out doing Kyuss songs and I certainly wanted to get on the bill and tag along. And we had a blast and the shows were fantastic and from night one, I would get up onstage and I would play "Green Machine" with them. That turned into a nightly ritual on that tour. And by the time we got to Hellfest, Nick and his band Mondo Generator happened to be on the same bill. But as far as I knew, John hadn't made plans for Nick to join us until that day. And a couple of hours prior to getting onstage…we were all hangin' out having beers and just chattin' it up…Nick mentioned "yeah John asked me to get up onstage with you guys". And of course we were all excited and like "wow this is awesome" and so in that sense it was very, very spontaneous. And then a couple weeks after that John called me and said "hey man I want you to come over and let's talk about some stuff". And I had a fairly good idea what I felt he was probably gonna pitch at me and sure enough he was like…"what do you say man, that was a lot of fun and you know, now is as good a time as any". So I agreed…"yeah let's do this man." And that's just pretty much how all this started. HP: Well that kind of answers my next question which was…was the decision to continue something that you kind of figured out right when you got offstage there at Hellfest or did it take some time to kind of sink in? So John contacted you pretty soon afterwards? BB: Yeah John contacted me very soon afterwards with an email…"I need to talk to you about something"…kind of thing. And then a couple weeks after that I actually went over to his house out in the desert and we sat down and we discussed the details of what we could possibly do and what some of the concepts were to get this back together. And really the initial concept was just to have Nick and John and myself and Bruno and just go do maybe ten dates in Europe and just have a really good time…and to have no strings attached and no power struggles or any of that nonsense. And so that was the initial plan and then when we went to press with the concept and the commitments to do a handful of shows in Europe…then the offers just flooded in and we just really had to move quick and kind of establish ourselves and start taking on what was coming in…and then it just kind of snowballed…and here we are. HP: Now I've read some things here and there that you and the rest of the guys are intending on writing a new album or some new music together. Has that process started? Or when can we expect something like that? Or is that even true? BB: Yeah that is true. After our first rehearsals and our first handful of shows, it was evidently clear that we were…rocking so to speak. And so we quickly committed to the challenge of creating new music. I'm actually in the car on my way to jam right now with Bruno on new material. So we plan to record in early February with the release of new material sometime next year. HP: You've mentioned Bruno a couple times and I had a question about him seeing as he's the new guy. I understand that John met him…what a few years ago when he sang on an album by his previous band…was it Arsenal? HP: So how's he fit in with you guys, being the lone guy not from the Palm Desert area…how's he fitting in? BB: Oh I tell you man, without Bruno this just really wouldn't even exist or even work. Bruno is…really, ironically enough…he's the cornerstone of this entire thing. I mean he's an amazing guitar player and he's an even more amazing person. He's very humble, very down to earth and he's very easy to work with. 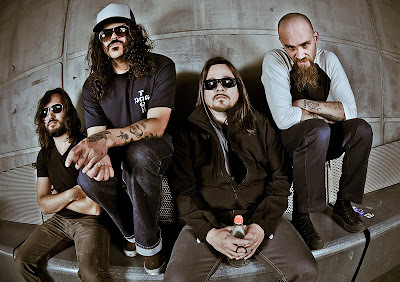 And you know…without going into too much…I'll just say that, that makes this Kyuss experience this time around really the exciting, inspiring, pleasurable experience that we always wished it could have and would have been. HP: Staying on Bruno…one of the legends back in the day about the "Kyuss sound" so to speak was that his predecessor Josh would play his guitar through a bass amp to kind of get that "heavy fuzz" sound. Does Bruno do that onstage now? BB: No, I think in the beginning, Bruno tried that, but it just wasn't something that we felt was necessary and it didn't really make that much of a sonic difference. I think Josh had a very specific guitar sound. Back in the day I remember when we were doing that, I think it was an extension of us just wanting to do things a little more different. But no, Bruno's playing out of a standard guitar cabinet. So far the guitars have been sounding great. HP: Going back to the Palm Desert scene…it seems like it’s kind of a revolving door of buddies out there who are constantly playing with each other in different bands and music projects and that sort of thing. I know Mario Lalli played guitar on some of the Kyuss music back in the day and Gary Arce as well. And Alfredo Hernandez obviously replaced you on the drums for the Circus album and then you ended up playing with him on some of your solo material and of course you've also played with Mario in Fatso Jetson and just all sorts of stuff. Is it still kind of like that? Is there this tight knit community of musicians? Do you keep in touch with those guys? BB: Yeah…I keep in touch with them…some more than others. I talk to Mario quite a bit and I see him. I'll talk to Gary every once in awhile. I haven't crossed paths with 'Fredo in awhile…it's been about a year since I've talked to, or seen 'Fredo. But you know, we're just all musicians and friends who have grown up in…like you said…in the desert and we've known each other for years. But you know we're all busy with our individual careers and our families and our lives. But yeah we all stay in touch as much as we can. HP: Couple more questions for you. I know recently Scott Reeder had to fill in on some of your dates while Nick dealt with some personal issues and I think that I read that he's gonna be playing on your upcoming Canadian dates as well. That's quite a bullpen to pull from when you can get a guy like Reeder to just step in…that's pretty cool. Can you talk a little bit about that? How did that process go down in terms of getting in touch with him? And I'm sure it must have been crazy for Scott to get that phone call…he probably hadn't played those songs in years and all of a sudden he's got to relearn them and get onstage with you guys. BB: Yeah well…you know there were only seven members of Kyuss and there were only two bass players, so Scott is the obvious and really the only plan B that would even be considered for what this is and what we're doing. And he's super excited to have been given the chance to get back onboard even though it was due to unfortunate circumstances. What can you say? Nick and Scott are very different musicians and ultimately almost polar opposite people. But they're both awesome in their own individual way and for whatever reason there's just not enough room for two bass players or even…with respect to 'Fredo…two drummers onstage for what we're doing. I mean Josh is the only odd man out here and it’s only because he obviously just chooses not to be part of it. But Scott is an exceptional bass player and we did four shows with him in Europe and it was amazing…of course, he had no problems getting right back into it. And you know…Nick…there's a fondness for Nick simply because Nick was there when the band was really forming. The essence of what Kyuss was and became was born with Nick on bass, so there's a fondness for that within. But Nick has a lifestyle that can be very interesting at best and when Nick is unable to fulfill an obligation, you're absolutely right; we have an amazing plan B. So we'll just have to see how things evolve…or de-evolve. But there are only two bass players for Kyuss and if either of those two guys isn’t able…then this just wouldn't work. HP: Yeah absolutely, I hear you. In my own opinion I would be just as excited to see either of those guys up onstage. They both seem classic and just sort of legendary in terms of the Kyuss legacy, so I hear what you're saying. Now, if I could shift gears a little bit to some of your solo stuff. I thought I read something or I've heard that you're involved with another new project…Jacuzzi…is that correct? BB: Yeah…I recorded a record…oh about eight or nine months ago that obviously has been on the shelf. But I plan to release it as soon as I can. And it’s a project…it’s just all instrumental at this point. I haven't decided to sing on any of it and I don't know if I will. And I don't know what I'm really gonna call it, but its working title is “Jacuzzi”. It's more kind of loose and kind of…it's me just kind of "improv"-ing on certain rhythms and riffs in the studio and there's a lot more jazz influence really, you know? HP: Well that kind of speaks to your other projects because honestly…well particularly with 2010's Gods and Goddesses, I thought there was just a multitude…for lack of a better word…of styles on that album from sort of psychedelic to even some Southern rock and I thought it was a great record. 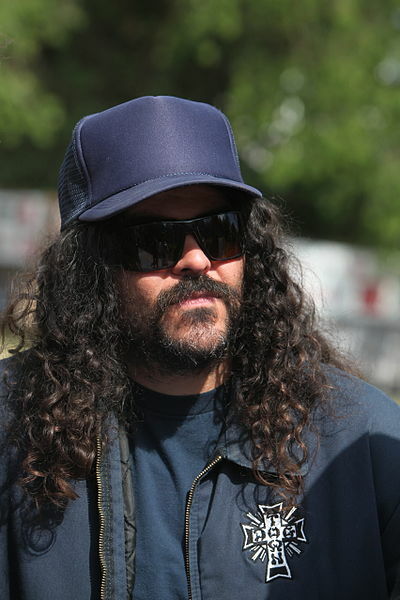 When can we expect the next one from your other solo projects, whether it's just you or Brant Bjork and the Bros.? BB: Well I don't know…I mean I committed to solo records for ten years and I worked pretty hard and to be honest I was excited that Kyuss kind of reared its head back in my life when it did because I felt that I could maybe use a break from my own insular little bubble. So I've kind of committed to Kyuss and to be honest what we're doing right now…the level that it's at…it kind of demands a certain level of commitment for it to work. HP: So that'll be full time at this point? BB: Yeah it's been full time to this point and I think it's gonna continue being full time for probably another…at least another year…before I could start putting the appropriate time into my other solo work. But I'm surely not abandoning my solo work in general. I'm always messing around with riffs and always writing and like I said, I have a lot of material that I recorded about eight months ago…solo material that's on the shelf as well…so I'm still working on that stuff but I've just been putting a lot of time and energy into Kyuss so I don't really know when I'll get back to my solo stuff. HP: Well it's kind of a cliché question, but kind of my wrap-up here. It's always fun to find out…what kind of stuff are you listening to these days aside from your own music…what bands or artists are you listening to? BB: I listen to a lot of jazz to be honest when I'm just kind of at home with the family and when I'm driving around in L.A. I mean I still like…you know, of course I still listen to rock…a lot of rock music from time to time. I'm really digging listening to a lot of Sonny Rollins and a lot of Monk. And I've really gotten into this band called…well they're not really a band, but like a session from Nigeria in the early 70's…no I'm sorry in Ethiopia. They were these sessions that took place in Ethiopia in a particular bar where a lot of African musicians congregated and jammed and it's called the Ethiopiques. And I'm really into that. That's a really awesome series of jams and music that I've been listening to quite a bit. Yeah…just you know…odds and ends. HP: One other quick question…considering you play just about everything, what do you gravitate to…what's your favorite? I mean are the drums your thing or do you have a favorite? BB: Oh I don't have a favorite, but I probably gravitate towards the drums just cuz it's more primal and more rhythmic. I mean drums are something you can do on a table with your hands, you know? So naturally I probably just do that more often. But yeah I love the guitar as well man, I don't have a favorite. HP: Well listen, that's about all I got for you Brant, I really appreciate your time. BB: Yeah well I appreciate you giving me a call man. HP: Well good luck to you guys on the upcoming tour of the States and like I said, when you get to DC in a couple of weeks, I'll be there, so I look forward to seeing you guys and I don't know if you'll be spending any time front of house, but if you do and I bump into you, I'll be sure to say hello. BB: Fantastic man, we're looking forward to it! Kyuss Lives will be touring North and South America throughout the fall and winter, so be sure to check them out. For tour dates, visit their Facebook page at the link below. I think I just read the coolest thing ever written. Score! Great interview, Reg. You asked him everything I would have. Thanks! But Toby gets all the credit for this one. He did a great job! Great interview. Not sure what to make of Reeder being "Plan B" though! Hope he gets the bass gig full time. I saw Kyuss Lives! in Houston, and they just don't have it anymore. They were not very tight. However, the worst part is John Garcia. His voice can't hold up and he seems just disinterested. This was the most disappointed I have ever been with a show. I enjoyed The Sword more, and I don't really like them that much. I saw them a few weeks ago in Greensburg, PA and totally agree with you about Garcia. We thought he had a cold or something. Kept on making weird facial twitches. As far as the rest of the band, I thought they were very tight and Bruno did a commendable job. Still missed Homme though. The Sword was remarkable and Black Cobra really impressed the hell out of me.